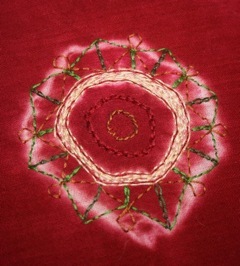 The irregular shapes of some of the circles make the embroidery rather challenging - I have to decide whether to treat the shape as essentially a circle, or whether to embroider in line with the white areas. Mostly, I have tried to keep a circular design. I'm not sure that this large double circle above has come out very well. Perhaps I'll come back to this later if I get some inspiration. This smaller circle works better, although it has irregular features. 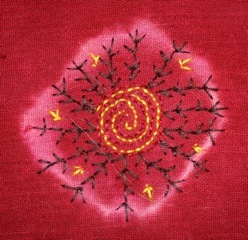 I can't find my box of embroidery cottons, so today I bought 20 more so I can get some more colours onto this. Hopefully, the silks should arrive soon. Lovely! I think the first one looks good too. Maybe it needs a little more work inside the first white circle. The light and dark shading on your background fabric really makes your work glow, like a light shining behind. Lovely. I think you're having fun! Mig Digitizing provides cheap and quality embroidery digitizing services around the worldwide. Free trial available to check the quality visit the website for more information on prices. More than 5000 stitch design will be on 50% discount. Same Day or Next Day's morning turnaround time. Our website is absolutely devoted to carry top-quality device embroidering digitizing styles. Each of the styles that we make is examined and even repaired in several types with different devices placed in the collection.